Star Ratings are critical to Medicare Advantage (MA) health plans. Achieving a 4-star rating or better ensures a five percent bonus payment; and plans with higher Star Ratings often enroll a higher percentage of members. Plus, a higher rating strengthens a health plan’s performance resulting in higher rebates which can in turn, be funneled to provide more value-added benefits for members. In such a densely saturated market, any differentiation that a health plan can use to attract more members can be extremely meaningful. First, payers should look at what factors contribute most heavily to their Star Rating. There are 48 measures with varying weights that factor into a health plans’ rating. However, for many plans the 14 measures associated with Health Outcomes Survey (HOS) and Consumer Assessment of Healthcare Providers and Systems (CAHPS) can be most impactful on overall results. Together, HOS and CAHPS constitute 27 percent of an overall health plan’s score and 36 percent of the Part C score. Based on their overall weight, there is no doubt that HOS and CAHPS results can make or break a Star Rating improvement strategy. 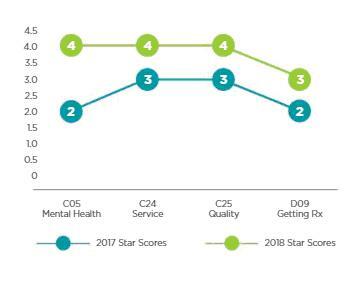 And, it is interesting to note that HOS and CAHPS results have remained relatively stagnant when compared to other Star performance measures over the past several years. Why are HOS and CAHPS measures so difficult to move? The majority of Star measures are clearly defined based on specific services received, claims or medical record information verifying access and delivery of care. For example, a health plan can identify all members that have a chronic disease and further identify specific care received during the measurement year. Interventions to close gaps in care can then be deployed to proactively target and deliver positive outcomes. This is not the case with HOS and CAHPS. These measures are based on member-reported results and perceptions of care and service, rather than objective diagnoses or claims. HOS and CAHPS surveys are based on sampling methodology and the results are aggregated, so no specific member details are available. Plans are essentially blind to the populations performing well or poorly beyond overall market trends or significant shifts in results. With limited actionable member data available, health plans often choose to just focus on broad, general interventions that affect the larger population and market trends; rather than clear, directive member-specific actions that could really improve HOS and CAHPS – and consequently, Star Ratings as well. Ultimately, health plans need timely and detailed member information about care and service perceptions to create interventions that drive improvements in members’ health and overall care experience. The first steps are to gather actionable member data, and begin micro-targeted actions. Even after achieving initial improvements to HOS and CAHPS measures, a multi-year strategy for continuous outreach is important. Member perceptions (and healthcare needs) can change over time so it’s critical to continually engage with members year-over-year. Plus, it’s rare to move all measures significantly in one yearly cycle – so a long-term commitment and strategy is essential to seeing marked results. Late December, a mid-sized regional health plan faced declining scores in a number of HOS and CAHPS measures. Like many health plans, this provider had limited ability to gauge member perceptions and needed immediate assistance identifying at risk members. The plan worked with HMS Eliza to rapidly deploy an off-cycle survey targeting their entire membership to gather member-level detail, barriers to care and insights into member perceptions. Typically, interactive-voice-response or web-based surveys are faster, generally less expensive and have higher response rates than mail surveys. Plus, data can be compiled in real-time allowing for rapid analysis and interventions. The information compiled from the survey was then used to address high-risk members immediately by using triggers or alerts to identify those members based on negative responses, and then providing immediate support through care management or customer service in order to mitigate possible issues and demonstrate their commitment to members. The plan also leveraged the survey insights to drive members to care and disease management programs that best meet their specific needs. Following a three-month effort, the health plan experienced 1 to 2 Star Rating improvements across three CAHPS measures and one HOS measure, effectively, effectively increasing its overall Star Rating from 3.5 to 4 Stars. By focusing on gathering detailed data about their members, payers have access to more actionable member data that they can use to effectively improve member outcomes and perceptions about care – and ultimately, improve their Star Ratings. Ellen Harrison is Vice President, Market Strategy and Consulting for HMS. She brings more than 20 years’ experience in strategic planning, managed care operations and consulting experience. HMS provides a broad range of coordination of benefits, payment integrity, care management and member engagement solutions that help move the healthcare system forward.